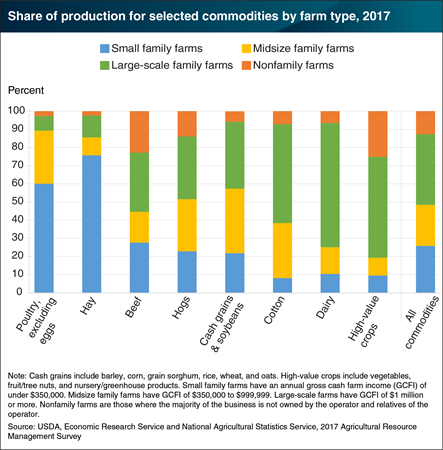 The distribution of U.S. farm production varies by commodity and farm size. In 2017, small family farms�those with annual gross cash farm income (GCFI) under $350,000�produced most of the hay (76 percent) and poultry (60 percent). By comparison, large-scale family farms�those with GCFI of at least $1 million�produced most of the dairy (68 percent), high-value crops like fruits and vegetables (56 percent), and cotton (55 percent). Midsize family farms�those with GCFI between $350,000 and $1 million�contributed large shares of cash grains and soybeans (36 percent), cotton (30 percent), and poultry (29 percent). This chart appears in the ERS topic page for Farm Structure and Organization, updated December 2018.